Easter is late this year with Good Friday falling on April 19, Easter Sunday on April 21 and Easter Monday on April 22. Given the time of year, most of us will be hoping for some sunshine and warm weather to make the most of the four-day bank holiday. But the UK could be in for a shock as it looks like it is going to be a cold break, according to the Met Office. 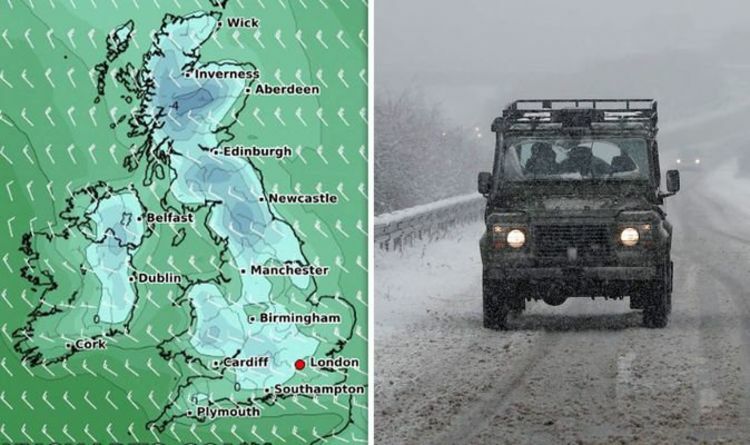 The Met Office’s long-range weather forecast says cold weather will prevail on Good Friday with a chance of snowfall in some parts of Britain. The forecast states: “Thursday and Friday will be cold but mostly dry across the north with perhaps a few light showers and some snow flurries, even to lower levels, but with no significant accumulations expected. “There is a greater chance of rain in the south, but details of this are uncertain and many areas will see some good spells of dry weather developing with some overnight frosts. “A gradual change to more wet and windy weather is likely to develop from the weekend, particularly in the southwest, perhaps spreading into northwestern areas. The weather pattern on Easter Sunday and Monday is less certain but the Met Office says things should get back to the seasonal average and there is a “greater likelihood or warmer and drier than average weather overall”. The Met Office has not given an indication of temperatures but the bookies have already slashed the odds on April being the coldest one on record. Coral has a 5/4 chance of it snowing in any major city over the Easter weekend. The bookmaker also has odds of 11/8 (down from 2/1) on it being the coldest April yet. What is the normal temperature for April? The Met Office says the UK’s long-term temperature average for April is 7.4C, as measured between 1981 and 2010. Last year saw an average of 8.4C, which was 1C higher, and the end of April was marked by a mixture of cloud, showers and some sunshine. As Easter is so late this year, there will be more daylight hours, therefore there is a greater chance of sunshine than usual. The Met Office says: "For Easters which fall late in April, up to 14 hours of sunshine has been recorded in some locations across the UK. "A notably sunny Easter was in 1984 with more than 100 stations recording over 10 hours of sunshine on each day between Saturday 21 and Monday 23 April. "Easter 2014 was also very sunny with 14.1 hours recorded at Kinloss (Moray) on Easter Sunday 20 April."